Malachite is a copper carbonate hydroxide mineral, with the formula Cu2CO3(OH)2. This opaque, green banded mineral crystallizes in themonoclinic crystal system, and most often forms botryoidal, fibrous, orstalagmitic masses, in fractures and spaces, deep underground, where the water table and hydrothermal fluids provide the means for chemical precipitation. Malachite is often confused with Malachite Green Chloride or Leucomalachite. Malachite Green chloride is a dye/pigment and is only called malachite because of its color. It contains NO actual Malachite, it is a chloride salt. Malachite green is prepared by the condensation of benzaldehyde and dimethylaniline. This dye/pigment is a cancer concern. Has scavenging effect on free radicals. Real Malachite (Copper) Extract is not a cancer concern. 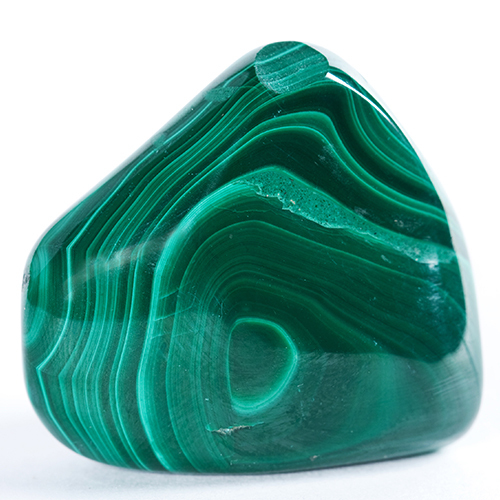 Ultimately, respected researchers appear to believe that copper (malachite) in certain cases may help. Adults have 50 and 80 milligrams (mg) of copper in their body, mostly in muscle and the liver. Copper helps make melanin, bone, and connective tissue, and helps with many other processes in your body. You normally get copper through your diet, in foods like organ meats, especially liver; seafood; beans; and whole grains. You get rid of copper in your bowel movements and urine. As with any mineral, too much is not a good thing, but our bodies need minerals to function & thrive. Malachite green chloride is a dye used to prevent fungus infections in commercial fisheries. Leucomalachite green is formed from malachite green and remains in the tissues of exposed fish. We studied the effects of malachite green on female rats and female mice, and the effects of leucomalachite green on male and female rats and female mice, to identify potential toxic or cancer-related hazards to humans. For each study we mixed the dye into the feed of rats and mice. The doses of malachite green chloride given were 100, 300, or 600 parts per million (ppm) for female rats and 100, 225, or 450 ppm for female mice. Doses of leucomalachite green were 91, 272, or 543 ppm for male and female rats and 91, 204, or 408 ppm for female mice. There were 48 animals in each dose group. Control animals received the same feed with no chemical added. The study lasted for two years. Tissues from more than 40 sites were examined for every animal. Rats, but not mice, exposed to malachite green chloride or leucomalachite green weighed less on average than the control animals. In rats exposed to the dyes, there were very slight increases in a few types of tumors: cancers of the thyroid gland, liver, and mammary gland in females exposed to malachite green chloride; of the thyroid gland and testes in males exposed to leucomalachite green; and of the thyroid gland and liver of females exposed to leucomalachite green. We saw no increase in cancers in female mice given malachite green chloride, but there was an increase in liver tumors in female mice given to leucomalachite green. We conclude that tumors of the thyroid gland, liver, or mammary gland in female rats might have been caused by malachite green chloride, but the malachite green chloride did not cause cancer in female mice. We conclude that leucomalachite green might have caused cancers of the thyroid gland in male and female rats, and of the testes in male rats and liver in female rats. Leucomalachite green caused an increase in cancer of the liver in female mice.